The Monarch butterfly (Danaus plexippus) is known around the world for its incredible mass migrations. Millions of Monarch butterflies travel south each autumn from the United States and Canada to California and the volcanic mountains in Central Mexico to escape the cold weather. Because the lifespan of Monarchs is so short (between 6 and 8 months), not one single butterfly that travels south will make the return trip back north the next summer; the next generations will do so. In places where the weather is warm year-round, Monarch butterflies do not migrate but stay in that one area for their entire lives. This is the case for the Dutch Caribbean Islands, where these butterflies are a common sight year-round, although they have been known to disappear during long periods of drought. On Bonaire, Monarch butterflies are especially abundant in the Washington Slagbaai National Park, notably at Slagbaai. Monarch butterflies are absolutely stunning. Their wings are bright orange with black veins and a black border with white spots. The fore wings also have three orange spots near the top. The rounded hindwings are a paler orange. Males have an additional black spot in the center of each hindwing. The black veins on their wings are also thinner than those of females. Both males and females have a black body with white spots. The scientific name of the Monarch butterfly, Danaus plexippus, is Greek for “sleepy transformation”, and refers to the butterfly’s ability to hibernate in a cocoon and metamorphize from a caterpillar into a butterfly. There are actually four stages in the life cycle of the Monarch. It begins as an egg, which hatches into a caterpillar (larvae) after 3 to 5 days. As a caterpillar, it spends two weeks feeding on milkweed plants, after which it uses silk to attach itself to a leaf or stem and transforms into a jade green chrysalis. It then spends 10 to 12 days within this chrysalis, or cocoon, and transforms into an adult butterfly through a process called metamorphosis. Nature is clearly nothing short of spectacular! 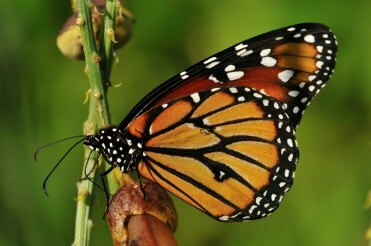 One fascinating fact about the Monarch butterfly is that it is poisonous. Not to humans, but to predators such as frogs, grasshoppers, lizards, mice and birds. The poison it has in its body will not kill these predators, but it will make them very sick. The Monarch absorbs and stores poison in its body when it is a caterpillar and eats the poisonous milkweed plant. By ingesting the slightly toxic milksap, the caterpillars becomes inedible to potential predators. Milkweed plants are very important to these butterflies; in fact, females will only lay their eggs on these plants. The rarity of Monarch butterflies on Klein Bonaire has been attributed to the rarity of its larval food plant, Calotropis procera, locally known as Katuna di Seda. Adult Monarch butterflies eat the nectar from many different types of flowers. Like all butterfly species, they drink the nectar using their straw-like proboscis, a long, thin tube that forms part of their mouth. When not in use, the proboscis stays coiled under their head.